There’s a bottle of Jim Beam in the house. Not sure when it arrived but it’s there. A friend of mine sent this image to me a while back. Sometimes I think my husband reminds me of Elliot Gould. I think he’d rather not hear that. He also gets called Wolverine in public by 7-11 clerks. And drunk guys in Vegas. Tonight we’re watching the Long Goodbye. A movie I swear up and down I’ve never seen, but one he swears I have seen. 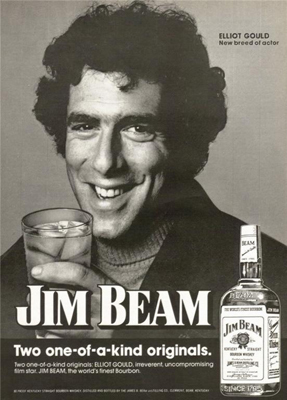 The movie made me think of this poster and that I should use Elliot Gould as an excuse to use up some of this Jim Beam. The first incarnation of this was so wrong. I had to cut down on the lemon juice and up the marmalade for added sweetness. This version though I’m pretty happy with. 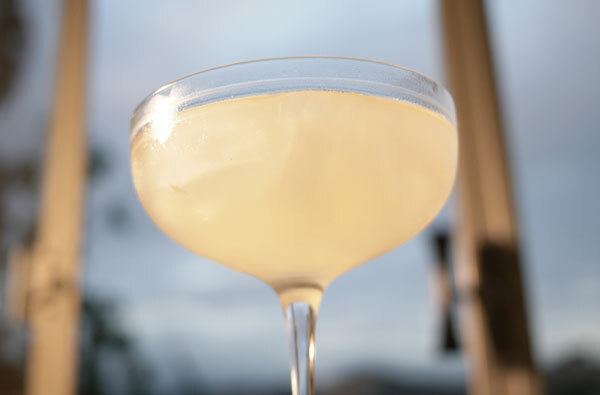 The drink has the right balance of sweet and sour, with really bright notes from the citrus. Also the citrus and the cherry elements play well off each other. In a shaker filled with ice, build up all of the ingredients sans cherry. Shake vigorously for at least 20-30 seconds to breakdown the marmalade as much as possible. There is going to be a lot o peel left in the shaker, but you’ll also get a lot of bits into your glass which is totally fine. 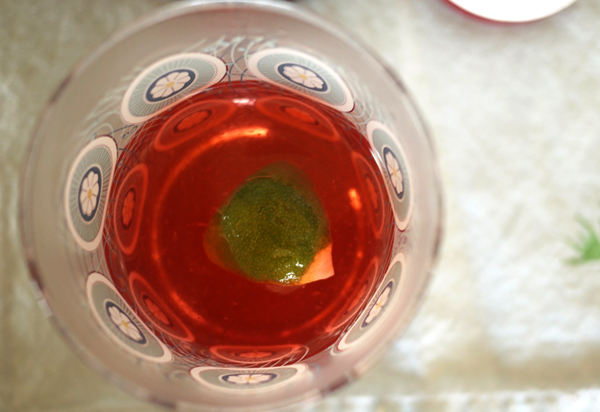 Strain into a chilled cocktail glass containing one luxardo cherry at the bottom. We’re heading out to the liquor store for a stock up! Be back soon with a restocked Shelves page and a couple drinks. If you’re even slightly interested in cocktails, you probably are aware that Tales of the Cocktail has begun down in New Orleans (no? you don’t know what I’m talking about? Read about it here and get ready to be jealous). This was on my ‘maybe’ plans but pretty much got written off due to an overabundant work load for both myself and my husband. Boo hoo and oh well. Honestly I’m crap trying to function in high temps with even higher humidity levels. So I’m vicariously living through the outstanding number of blogs covering the events, the parties and anything else thrown in between. Since there are too many places covering it and not wanting to leave any people out, a good starting place if you also want to be in the know would be the blog for Tales of the Cocktail itself: HERE. If you’ve discovered the wonderful thing that is the google reader, you can just add that RSS feed on there and periodically check out what’s happening. There’s also a twitter feed, but since I have to be dragged kicking and screaming into figuring out how that works, I’ll let you all figure out how to get on there yourselves. I’m heading out to spend my lunch break catching up and making notes of new products and recipes. Also, on Bon Appetit this morning ran into THIS post on the front page. 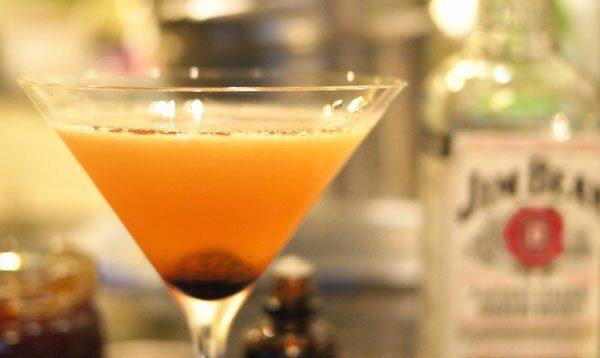 Erik over at the Savoy Stomp blog summed up my shared opinion a couple months back in a nice, well articulated argument against what seems to be a mounting backlash to those in the world who enjoy mixology, well crafted cocktails, etc… , read it here. I put this link in here because otherwise my only response was to read the Bon App article in the voice of Andy Rooney and you’ll get a laugh. To each his own, but still, funnier in a crotchety old man voice. Necessity breeds imagination. Isn’t there a saying along those lines? This weekend we’ve holed up in the house for a couple reasons. One, work. Work work. My husband has a lot of it. 90% involving computer and programming and other things that make no sense to me. Second is also work. House work. Lots of dusting due to the start of what is to be a long, drawn out construction project that has already resulted in the loss of use of the downstairs bathroom. And a couple of fights with the home insurance agency. Third, the closure of the 405 freeway. For a short while now we’ve been warned by the transit authorities to STAY AWAY from the west side of town. Avoid the airport!! Avoid leaving your houses!! Better yet, just leave town until Monday morning. Last check all the freeways were green and I’m sure all those idiots who paid for expensive helicopter rides over what was supposed to be insane gridlock for 40 miles in every direction are kicking themselves right now. Deservedly so in my opinion. Anyway, we bought some grill fixings and decided to just stay put for two days. No biggie. Except that we somehow forgot to stock up the liquor cabinet. It’s been slowing bleeding out for the last month or so. Company comes over and there goes that bottle of Buffalo Trace. And oddly a whole bottle of Jägermeister (how did that get in there?). And wasn’t there a bottle of Finlandia for Bloody Marys? Surprisingly though we had a couple of almost depleted Tequila bottles. Enough to make some cocktails. But with no whole limes around the house either, a Margarita was out of the question. And I have just been informed by the husband that he really isn’t a fan of them anyway. There was a whole bottle of Campari though. No gin- the Aviation got used up in some martinis two days ago. Home bartenders are hanging their heads at this sorry state of this liquor cabinet right now. 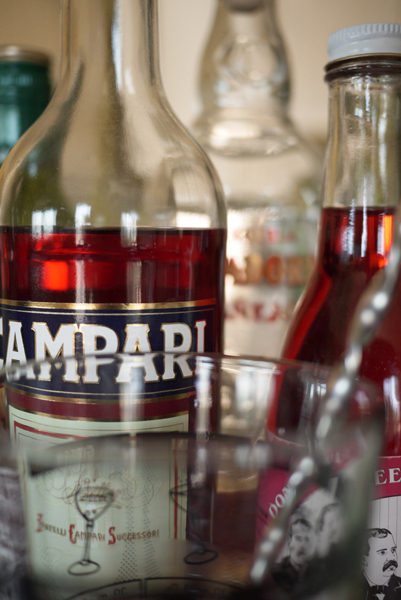 So a quick search on the internet for tequila and campari brought me to the A Dash of Bitters blog. And this post here. This recipe below is only a slight modification. I upped the Campari by a ¼ ounce to blow out the tequila and make the Campari stand out more (my reasoning was that I wanted this to taste like Campari, not just a slight bitter aftertaste). I also added a squeeze of lime. I felt it needed a touch of an acid. And tequila and lime, blah blah blah. So here you go! It’s slightly bitter and tangy and a hint of that rich reposado tequila is there in the background, which is where I wanted him to be. Stir all of the ingredients together with ice. Strain into a chilled rocks glass. 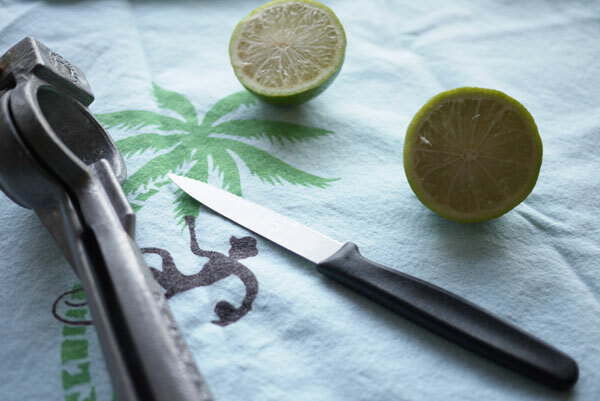 Garnish with spent lime. After I made this I glanced down at the comments and realized that others were also adding limes. I think I’d nix the Maraschino syrup next time because I don’t feel like it adds much. 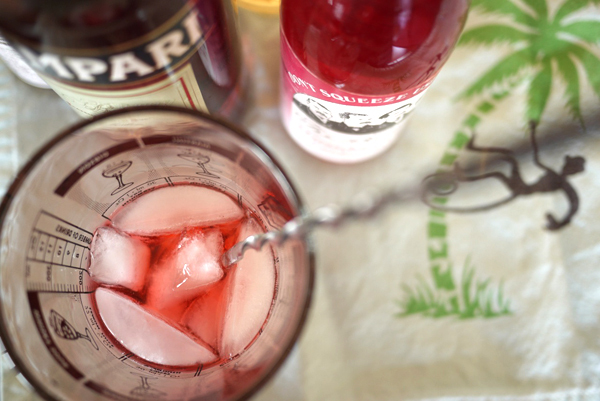 In fact, for the next round I made this with Aperol instead of Campari and left out the syrup. Then I subbed out some Castillian Bitters from Miracle Mile Bitters (a local, artisanal bitters company in L.A.) I thought it worked, but another taste tester, not being a fan of the Aperol, thought it tasted too medicinal. To each his own. I will be enjoying this on the porch by my little lime tree that is slooooooowwwly growing me some new limes. The biggest about the size of my thumb. The idea behind having a scratch pad blog is that you tell yourself you can go a month or two without having to write anything because nothing new has come to fruition. Which has been the case. Night after night of Angelas and Manhattans until one day picking up a bottle of Aviation Gin on a stock up trip at BevMo and realizing: this.is.my.new.favorite.gin. I’m not really using this site as a review site. If something that I enjoy happens to be worth sharing, I will simply let you all know what that is. 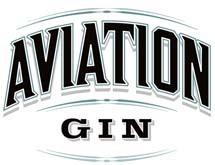 Why Aviation Gin? It just tastes fantastic. The anise in here really pops and I capital L love anise flavor. Currently there is a bottle and a martini glass living in my freezer…. I don’t think I need to spell this out folks. Can I name this drink the Lazy Man’s Martini? 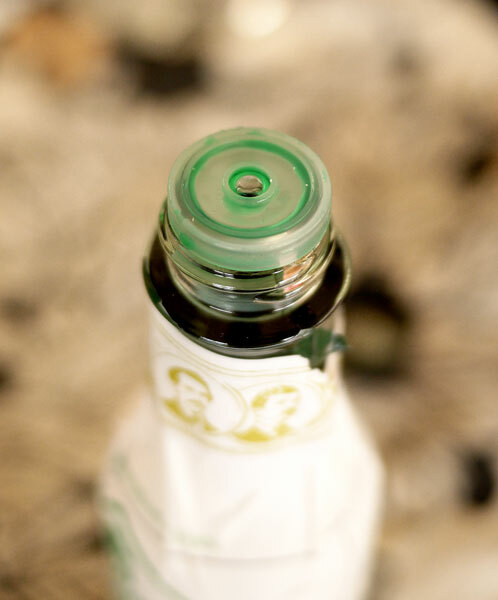 Anyways, if you were following the Limoncello saga, you might want to strain it out of that bottle, stick it in a glass bottle with a nice stopper-top, and stick that kid in the freezer. It’s done. Also, I had the opportunity to sit in on a new Bitters vendor at work today and I have 8 new reasons to make some fantastic tasting drinks. Word is that the Cana Rum Bar and the Tar Pit already are using these. Hopefully soon I can let on who and where to buy them. The best news about these: no dyes. Sorry Fee Brothers, you just got bumped. Your Peach bitters is about to become shamefully shelved. 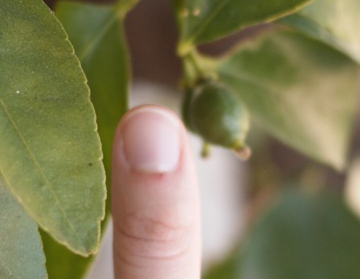 Recently we invested in a lime tree. Or rather, I had one picked up and brought to the house and my husband came home and wondered when a lime tree had relocated itself next to the front door. It smells amazing. I immediately had to make a drink out of it, and luckily I had an order for a drink. Stat! I always associate limes with Daiquiris and I figured this was an easy jumping off point to really indulge in the flavor of the fruit. And it really does. It’s perfectly sour and sweet, and with just three ingredients and the right balance, all are identifiable yet harmonized. 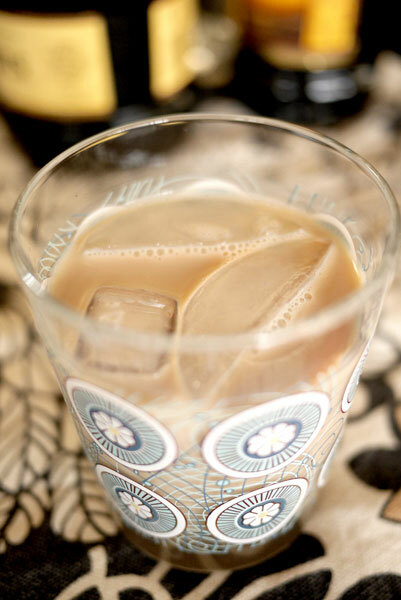 This drink also packs a nice punch, which in part influenced my decision to serve over ice. I read up on a couple different versions, and figured if you want to sit and sip this, a couple of ice cubes help draw out the time you get to spend with your Daiquiri. 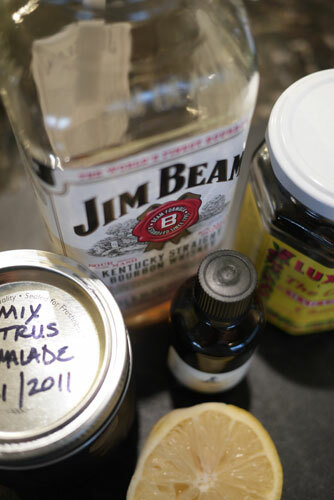 Add all ingredients to a cocktail shaker filled with ice. Give it a good shake and pour into a chilled champagne saucer filled 2/3 with ice. Contemplate the next fruit tree purchase. I enjoy Gin and Tonics like some people enjoy water, or cocaine. They go down pretty easily and are light enough that I can have them with the heaviest of meals. Occasionally though they get quite dull and an extra oomph of something is needed. I like to think that many cocktails are given birth with that thought process. Foul, rancid water? Hey, let’s add some beer to that! And so forth. So a week or so ago we went over to BevMo and stocked up on some more items for the bar. On a recommendation we found and picked up a bottle of Aperol. Aperol is another of those Italian aperitifs… slightly bitter, slightly sweet. This one tastes of oranges. The syrupy nature of this liqueror made me think that it needed a couple of ingredients to cut that down.. and so I thought of a gin and tonic. And the conclusion? So. freaking. tasty. 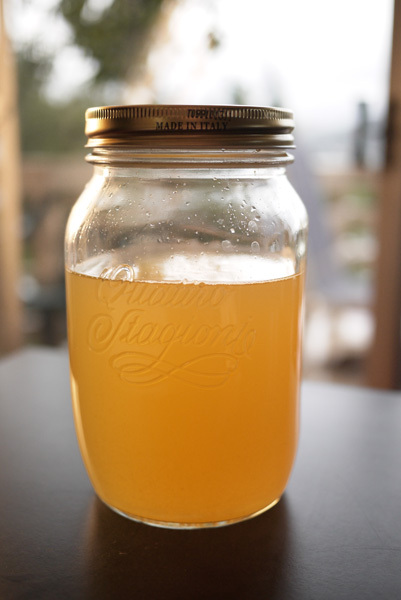 I need to make a barrel of my own tonic water because I think this concoction might just become my new summer drink. 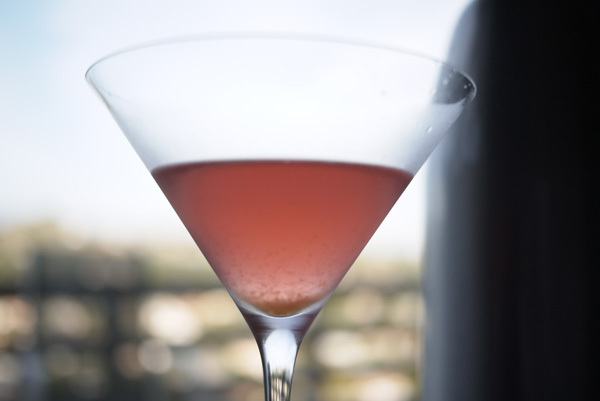 Fill a Collins glass 2/3rds with ice and build up with gin and aperol. Top glass with tonic water. Recently a copy of The Savoy Cocktail book arrived in the mail. It was a belated Valentine’s Day gift from my husband. Belated not because of him, but because Amazon couldn’t decide if they wanted to ship it to us or not. Emails kept popping up in the inbox saying things like, click this link if you’re really certain you want us to send this to you whenever it comes in stock; the outlook was grim that this would ever arrive. But then it did. I’ve been trying to find drink recipes to use up the bitters I bought and I thought the earlier cocktail recipe books could help in that category since they were dropping them in to all sorts of drinks back then. Scanning the book I came across the Yale Cocktail. However, I realized that I would immediately have to make a couple changes as I have still not bought any Angostura bitters (I know… I know…). Also, the recipes are coming directly from the original book and the measurements are kind of all over the place. Sometimes there are just fractions and other times it just says to put in a wine glass full of something or in this recipe, a glass of Gin. Now, my idea of a glass of gin and Harry Craddock’s idea could be on opposite sides of the room. I’m sure out there somewhere someone has compiled the measurement translations… but why make it easy on myself? Well, all I had in the house was Hendrick’s and for this cocktail, it just wasn’t working. 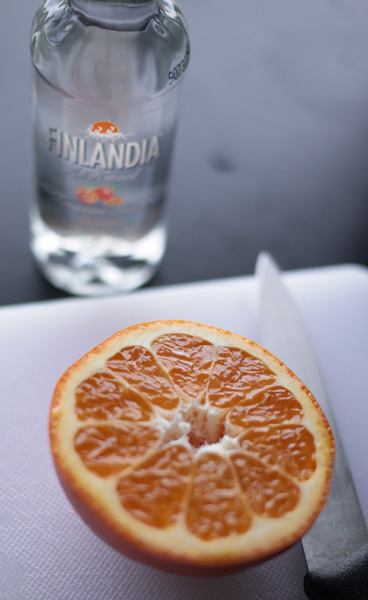 So then I remembered that I had a 2oz bottle of Finlandia Tangerine Fusion (it came with a much larger bottle of regular Finlandia) and thought maybe that I would use it here. It worked! I had to up the amount of orange bitters to really give it the extra flavor I was looking for, and I went with 1/2 the juice of a tangelo instead of a squeeze of lemon. The end result: spicy and then fruity, which was the right combination for me. Next I need to work on proportioning glasses to the drinks.. I always seem to come up with too much room in the glass. In a mixing glass with ice combine all the ingredients except for the club soda. Stir to combine, and strain into a small chilled cocktail glass. Top with club soda. 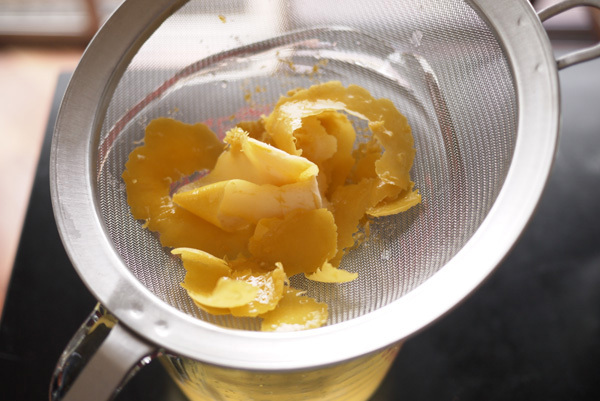 It’s been two weeks and it’s time for part two of making Limoncello. First, take out that bag of lemon juice that’s been in the freezer. This was from the 4 lemons you zested two weeks ago… What? You forgot and threw them away? Fine, go squeeze 4 lemons and come back here. Next thing you need to do is strain out the lemon zest that you’ve been shaking around everyday. You’ve been doing that, right? Good. Depending on which way you went, you may have to strain twice. Since I used a combination of fine zest and strips of lemon peel, I had to do it twice. First strain went into a large pyrex measuring glass using a fine mesh strainer. I pushed down a bit on the zest to try and release as much liquid as possible. Then I decided to switch jars I was using, mainly because I could use this giant jar for another project (coming soon!). The second strain I used an extra-fine mesh strainer to make sure I got most of the floaty bits. While you’re doing this you should go ahead and start making the simple syrup. Combine water and sugar in a sauce pan and put over low heat until all the sugar has dissolved. You might want to gently swish the pan around at first just to help with the dissolving. Then take the pan off the heat and allow to cool completely. Once cool, combine the simple syrup and lemon juice and pour into the vodka mixture. Now cover it tightly and let it sit for 6 weeks in a cool, dark place. In 6 weeks come back here for the exciting conclusion! No wait! Come back all the time for drink recipes!